So, May was another easy month. I just had two birthday blocks to do for the swap. Which has been good because with the current theatre production, I've been pretty busy/low on available crafting time. This is Aalia's block. She asked for a Strips and Squares block with greens on black. 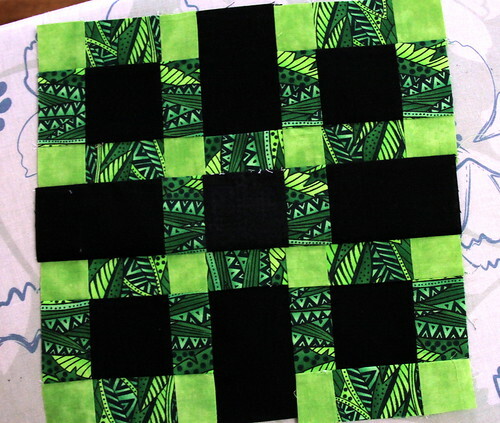 This Laurel Burch type fabric is one of my favorite greens to use in swap blocks that call for both black and green. This is Lisa's block. She asked for a beach house. 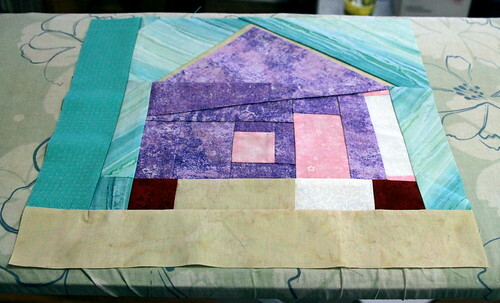 I have mixed feelings about this block. I guess I can sum it up best by saying that it's better than I expected, but not as good as I had hoped? June will be here soon and I just realized that I haven't started on the June 12 for 2012, but I will have a couple of bonus finishes! Plus, June is when the show goes up and CSA season starts up - I can't wait!